Just as you might expect from a company that has a reputation for paying attention to sensitive skin, Clinique's A Different Nail Enamel is designed to "minimize unwanted reactions to the nails and skin and eyes." It might surprise you to know that nail enamel is considered by dermatologists to be a significant contributor to irritation and contact dermatitis, including a rash that can develop around the eyes, all just from a freshly-manicured hand touching or rubbing against skin. Although I have never considered nail polish to be a culprit in my own dermatitis, I'm sure there are people out there who are loving Clinique right now for formulating a nail polish for sensitive-skinned folks. Summer always seems to start horribly late in Vancouver--I distinctly remember one year when it basically rained all June and July and then there were two weeks of sun before it started all over again. Thankfully with the A Different Nail Enamel summer collection, I can still have summer on my fingers and toes no matter what the weather is like outside. 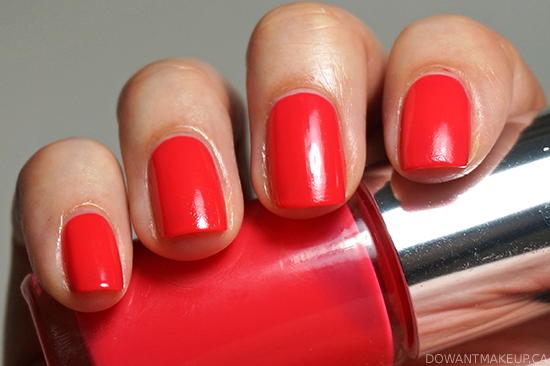 Starting off with one of my favourites in the collection, Summer in the City is a fun, bright-but-not-neon coral. It has a squishy, jelly polish-like quality that needs three coats. It applied very smoothly and self-leveled well. It is nearly indistinguishable from Essie Flirt, although under bright sunlight you can tell Flirt is a bit deeper. 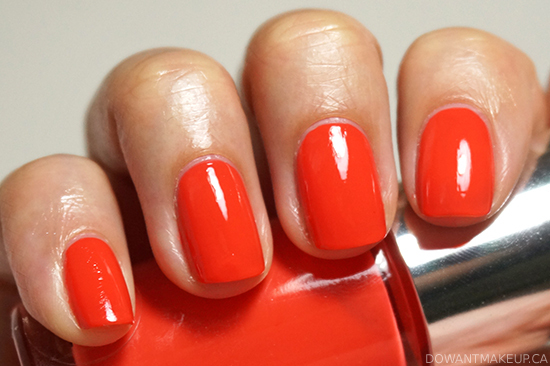 This is a perfect summer colour. I was floored by how well Summer in the City wore. I had it on my nails during a busy weekend that involved a lot of cooking, cleaning, and dog petting (and the frequent hand-washing that goes with all these things) and didn't have a single chip by the end of it! 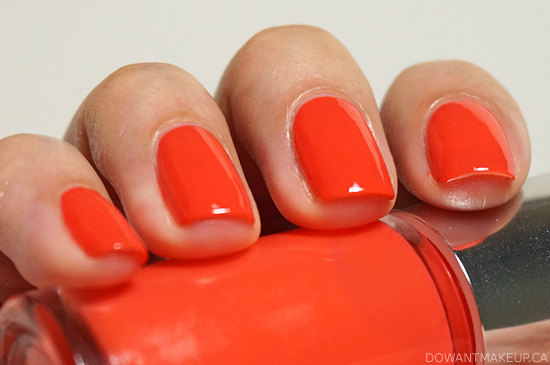 Juiced Up is a punchy and juicy orange, and it is so very stunning. If you could only buy one colour from Clinique's summer collection, it should be either Summer in the City or Juiced Up. Just like its sister, it applied and wore very well with two coats. I absolutely hate feet but I would totally rock this on my toes at the beach. Revlon Mad About Mango and L'Oreal Colour Riche Tangerine Crush are close, but Juiced Up is the brightest of the three. Grape Ice's fuchsia is a little more subdued than the previous two, but still a fantastic summer shade. It's perfect for people that like colour but are hesitant to wear something really bright. It is perfectly opaque in two coats. Pinkini is holy-crap-bubblegum-Barbie pink. 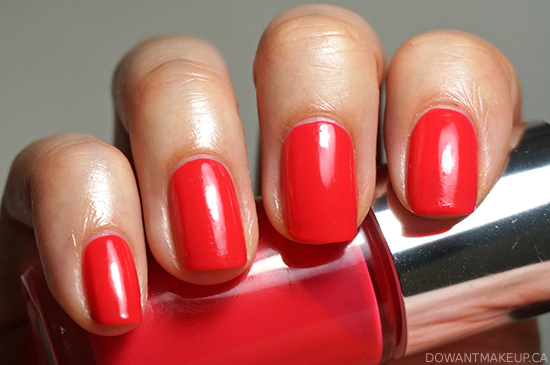 This is a very fun, bright pink that I know a lot of people will love. Personally, Barbie pink is one of the few nail polish colours I avoid (I'm just not into it) but I do believe it's neutral enough for most people to wear well. Two coats is enough to achieve this super-saturated pink. In terms of wear and application, these four are pretty successful. And in terms of colour, they are just plain gorgeous and fantastic summer staples. However, I do have "wrinkles" on some nails due to being smushed by something before they were fully dry. I used A Different Nail Enamel Base and Top Coat, which did a great job of protecting my mani, but seemed to take awfully long to dry. Then again, I'm used to quick-dry top coats such as Seche Vite and butter London's P.D. Quick Topcoat, so maybe someone less biased can tell me if Clinique's top coat is extra slow? Swatches of the second half of the summer collection are coming up soon!